Diana Containerships Inc. (DCIX) took everybody by surprise last Monday, when it announced the sale of its 18-year old Panamax containership "Spinel" (Ex "APL Spinel") for demolition. The "Spinel" fetched $9.65 million before deduction for brokerage commissions. The 1996-built vessel had been purchased from American President Lines (APL) less than two years ago in a $30 million sale-lease back deal. As part of the deal, APL had agreed to charter the vessel for two years at a daily gross rate of $24,750. The "Spinel" had just been redelivered to Diana from that charter. This is the fourth time that Diana Containerships is scrapping a vessel following her redelivery from a sale-lease back deal. Vessels "Maersk Madrid", "Maersk Malacca", & "Maersk Merlion" had been scraped earlier this year. Diana Containerships had previously booked a loss of $36.9 million on the sale of the three Maersk vessels. This time will be no different, as I expect the company to record an accounting loss on the sale of the vessel of approximately $10.5 million. 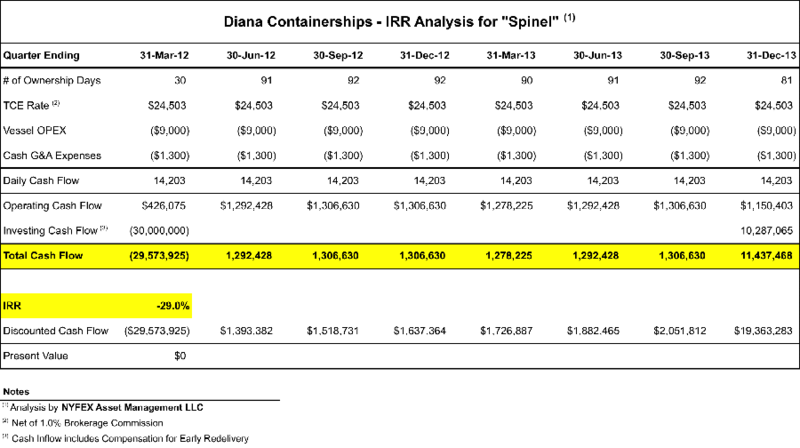 On a cash flow basis, Diana Containerships generated a negative IRR (internal rate or return) of -29%. The negative investment return underlines once more the huge residual risk of acquiring vessels at premium prices in sale-lease back transactions. This was true for the 1989-1990 built Maesrk vessels, and it is also true for the 1996-built "Spinel". Unfortunately for Diana Containerships, the "Spinel" might not be the end to this vicious cycle. The 1995-built sister-ship "APL Sardonyx" is scheduled for redelivery from APL as early as this coming January. The vessel had been purchased simultaneously with the "Spinel" on identical terms. One has to wonder, will it have the same fate as the "Spinel"?